I believe juicing is no longer anonymous to many of us here in Malaysia! In fact, there's more and more of you out there started juicing at home. However, do you know that there's a difference of using centrifugal juice extractors (typically utilize a fast-spinning metal blade that spins against a mesh filter, separating juice from flesh via centrifugal force) and a slow juicer (cold-pressed juicer)? I've learned that cold-pressed juice retains the maximum amount of nutrients as the fruit and vegetable are put through a cold-pressed juicer. On the other hand, if the fruit and vegetable being sliced by spinning blades, it can be overheat and oxidize the juice, resulting in nutrient loss. Juice D' Fruitz not only served cold-pressed juices, but also some choices of food to their patrons. The Shades of Salmon (my favorite!) made of smoked salmon slices, Romaine lettuce, rocket leaves, black olives, parmesan cheese, poached egg with sesame dressing. If you wish to try out something different, you can always opt for the California Salad - Romaine lettuce, rocket leaves, mushroom, capsicum, sweet corn, raisins with sesame dressing. We all agreed that the California salad has a unique mixture and tastes interestingly different too, not sure if it's because of the mushroom. Sunshine Platter consists of cheesy ham, chicken sausage, sunny side-up, baked beans, garlic breads and salad. This is such a big breakfast for one person portion! And yes, this is under the All Day Breakfast section in the menu. Before you decided to order this (which you really should, especially if you're mushrooms lover! ), the portion served for one pax is as shown here. It's huge. We were all surprised and if you wonder, Dancing Mushroom consists of three different types of mushrooms mixed with cheese and mayonnaise. Eric and Anna enjoyed this a lot, it wasn't too creamy but nice. Oh! We all loved the croissant! You can order a slice of cake from the counter or simply order the Fruit Platter with Chocolate Dip to enjoy a mini fondue session with your pals. I love that the chocolate dip is not the super sweet type with a hint of bitterness, just the way I like it. 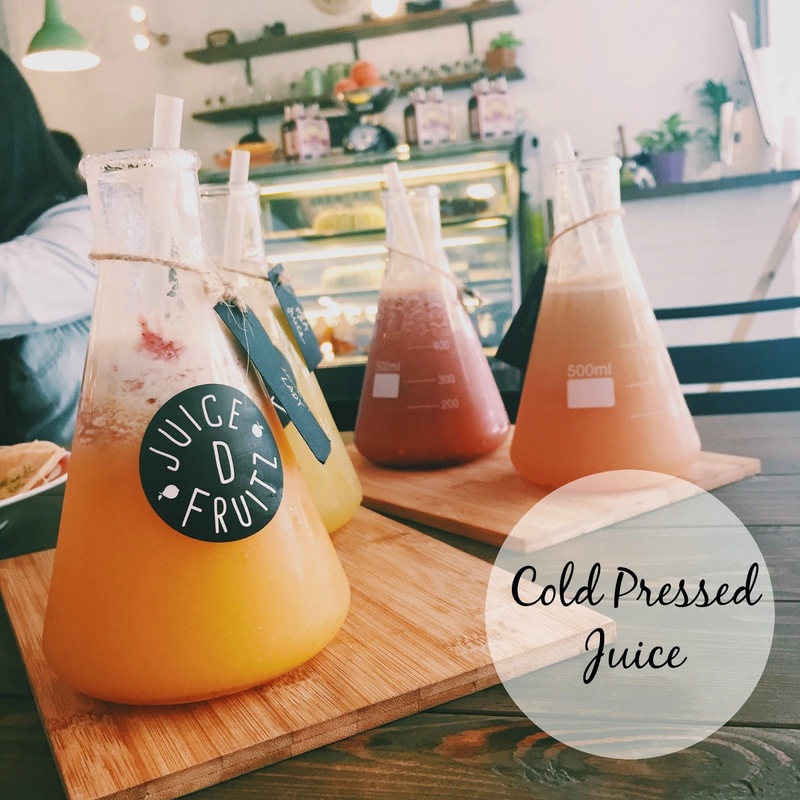 If you happen to be in Puchong area, why not drop by to either grab a healthy cold-pressed juice fix or just chill inside the cafe whilst enjoying the juice and food!